The first LEGO game based on Marvel’s cinematic universe is here, and wait until you see the wonderful ways the folks at TT Games have twisted the first Avengers film for comedic effect. LEGO Marvel Superheroes is an excellent game, but it’s an original game. That means the developers got to develop their own story, write their own dialogue and make their own jokes. LEGO Marvel’s Avengers, available today for all of the game consoles and handhelds, is a game that follows the events of The Avengers and Avengers: Age of Ultron, with scenes from some of the satellite films thrown in for good measure. TT Games had to work with the existing dialogue from those films, and they’ve done so brilliantly, adding their own LEGO-fied comedic beats to existing scenes. The way they’ve woven in the jokes here is amazing. I especially appreciate the riff on Banner’s line “What does Fury want me to do, swallow it?” Genius. The Avengers are gathered, and soon Loki makes his presence known in an incredibly subtle way. Okay, maybe not so subtle. As pleased as I am with Hawkeye’s key arrow and Stan Lee reprising his role as Stan Lee, I’m a bit disappointed with the editing out of Reindeer Games from the last line there. Aw well, can’t have everything. Loki is of course captured and taken to the S.H.I.E.L.D. helicarrier. 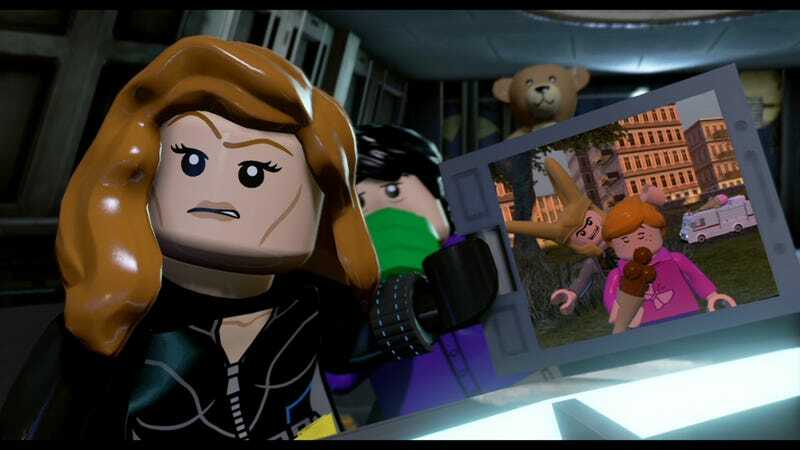 What I love about this scene, aside from the teddy bear and replacing Loki murdering people with stealing a child’s ice cream, is that it shows how the devs at TT Games seem to be quietly developing the relationship between Black Widow and Banner in the second film in a way the original movie did not. They’re fixing things. But the situation on the helicarrier cannot be fixed. Under Loki’s influence tempers rise, the team begins to fall apart, and awww man, we don’t get to see Banner’s party tricks. They really have a lot of fun with Hawkeye in this game. Here comes my favorite part. Loki’s attack succeeds, the helicarrier is crippled, and a stalwart ally falls. Sort of. The vacation ticket. The sheep. The fact that Captain America signs the cards. Wonderful. Which takes us to one of the most spectacular moments from the film, and Banner knows it. What really sells it is the bit at the end, where for just a brief second they’re all just standing there, looking around, wondering why they’re posing like that. I’m still playing through LEGO Marvel’s Avengers—I’m at the farm right now, smack dab in the middle of movie two—but so far, so good. It’s standard LEGO action with a few twists in between the movie scenes, but man, these movie scenes. Look for a full review of the game soon. Until then . . .